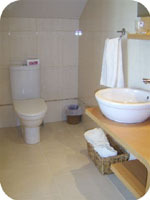 One of the en-suite bathrooms. The house interior is light and airy. An under floor heating system is in operation throughout. The hallways are tiled while the guest lounge and dining room are both oak floored. Breakfast is served in the spacious dining room and guests are given a wide and varied selection of foods for starting their day. Care and consideration is given to those with special diets. All guests have access to free wireless internet! 2 x Double ensuite with shower (sleeps 2). 1 x Double and two singles, ensuite with shower (sleeps 4). Each bedroom is generously proportioned with oak wooden floors and an ensuite which is tiled from floor to ceiling. A hospitality tray, hair dryer, shaver plug and LCD flat screen television is also provided. The ensuites have wet areas with power showers and towels are changed daily. A family room with a double bed, two single beds and a child’s cot is also available. This room will comfortably accommodate 4 adults.